Beware of my review of Crimson Peak! Crimson Peak is a movie that I have been looking forward to all year. It tells the story of Edith Cushing, an aspiring writer who is swept off her feet by London aristocrat Thomas Sharpe. Once she becomes Mrs. Sharpe, Edith moves to London to live in Allerdale Hall with Thomas and his sister Lucille. However, a house as old and decrepit as Allerdale Hall is bound to be riddled with secrets written in blood. This is the latest film from Gulliermo del Toro, the creator of my all-time favorite film Pan’s Labyrinth. Since PL, Del Toro took a step back from creating gothic stories of his own and turned his attention to being a producer of Don’t Be Afraid of the Dark (2010) and Book of Life (2014), as well as directing the second Hellboy film (2008) and Pacific Rim (2013). After a few days of prayer and going over my review notes, I have come to the conclusion that Crimson Peak is a visually stunning canvas that highlights Del Toro’s strengths, as well as his two major weaknesses. A few months ago, I learned that Del Toro actually had the mansion built and even used his own salary to keep it from being demolished. His dedication is on full display. Allerdale Hall is the personification of horrific secrets. Red clay oozes through the house like a silenced prisoner struggling to break free. A gaping hole in the ceiling allows leaves and snow to fall to the floor, symbolizing the tears of the past victims of Allerdale. Creaking staircases, a rickety elevator and a lower level with blood decorating the walls create an atmosphere of death’s final sting. Del Toro’s vision of Allerdale is a nightmare fully alive. During the second act, there are three sequences where Edith wanders the house to investigate. The danger here is that the scenes can become repetitive, but luckily the movie doesn’t fall into this trap. Each exploration scene contains new information on the ghosts that haunt Thomas and Lucille’s home. Edith discovers something different, making the three sequences feel purposeful. The assembled cast is excellent. Tom Hiddleston and Jessica Chastain have a terrifying chemistry as brother and sister, while Mia Wasikowska carries the film with sharp intellect and vulnerability. During production, Del Toro gave each actor a ten-page biography of their character, and it shows in their performances. Unlike a certain film that I reviewed recently where indecisive directing resulted in confused performances (I’m looking at you, Pan! ), everyone knows exactly who they are and how to convey their characters’ motivations to the audience. I mentioned earlier that Del Toro has two major weaknesses that are clear as day in this film. In my Pan’s Labyrinth review, I pointed out that there is a major continuity error that occurs after Ofelia completes the first task. It doesn’t ruin the movie, but it does show that Del Toro needs more practice on bridging continuity gaps. In Crimson Peak, there is one major narrative flaw that is concerning. Edith’s ability to see ghosts is not the reason Thomas marries her, nor is it the reason why [SPOILER] Lucille wants her dead. This is a problem because Edith’s special gift and her relationship with the Sharpes are the two most important elements of the story. If these two components have nothing to do with each other, if the story could go on without one of these two plot points (in this case, the ghost-whispering thing), then something is wrong with the story structure. The second narrative weakness is that Del Toro is not good at plot twists. My friends and I could correctly guess the “twist” long before the third act’s big reveal. I mean, Guillermo, you made Pan’s Labyrinth HOW long ago (2006) and you still don’t know how to properly connect gaps in your story? 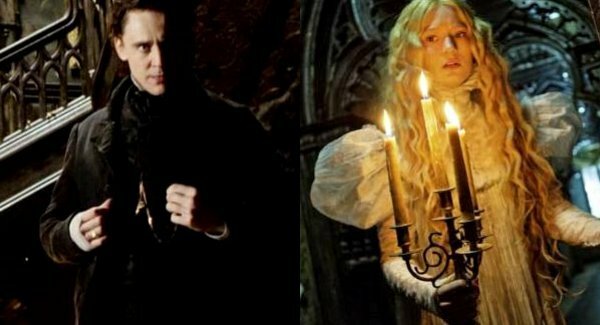 Crimson Peak is a fascinating gothic romance that pays homage to the genre. At the same time, it also shows eyebrow-raising missteps that would concern any Del Toro fan. Here’s to the hope that good-ole Guillermo catches his own mistakes and works on improvement for future features. Sometimes directors will use symbols and images in a current film to refer to a previous film that they made. I figured that Pan’s fans like myself would enjoy these callback trinkets. Crimson Peak opens with Edith staring into the camera while holding up her bloodied hand, which is similar to Pan’s Labyrinth prologue. The majority of the nighttime scenes are shot with a turquoise color palate and not the traditional midnight-blue color palate. Edith’s father uses the exact same razor that Captain Vidal uses during his [Vidal’s] character-defining shaving scene. Also the mirror he uses is Vidal’s shaving mirror. The wheelchair that Edith uses towards the end of the first act looks oddly identical to Carmen’s wheelchair in PL.